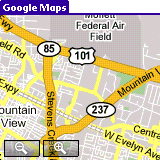 This week Google released a downloadable mobile Google Maps application for Treo smartphones. Perhaps proving that Palm OS is not dead yet, this is a great example of an application that can provide a better experience than a web browser. Overall the application is pretty quick, even on my poor old Treo 600. Local business integration and traffic are great. 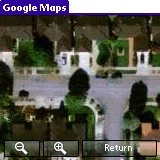 The Satellite view is kind of cool, but I’m guessing most users would stick with the street view. Bonus points for over the air install (i.e. no need to install from desktop and HotSync to the device). Update: To learn more, check out an in-depth review with lots of screenshots on Treonauts.com: Google Maps: Completely Hooked.